This plugin adds a simple embeddable forum. The forum does not require immediate configuation to operate. However the following options are available. Forum categories (Channels) can be managed via the System > Channels menu. Forum members can be managed via the User menu. You should tell this component about the other forum pages. channelPage - the page used for viewing an individual channel's topics. topicPage - the page used for viewing a discussion topic and posts. memberPage - the page used for viewing a forum user. An extremely useful plugin (for free, even better) and makes implementing this function quite easy even for the casual developer. I use this a a simple communication tool inside a private union website. It does what I need and the price is right. Cool plugin. But I have issue as Serkan Agdelen on /forum/member/username page. Non-Latin post (in my case is a Cyrilic) show as "Н�О�В�О�С�Т�И�2015", but in DB texts are correct. How to fix it? Really, gr8 plugin. But same problem as @Serkan Agdelen said. In member page got weird marks. Is there any option to restrict diffrent forums to specific users? Hello, I am building site with forum plugin and blog plugin like your tutorial but i am having difficulties on comments. When i post comments under blog entries (in turkish language) all comments are ok. But when i go to member page to see the same comment i see character encoding problem. For example: I write "ıöçşğü IÖÇŞĞÜ" under a blog entry and it seems ok on that page. When i browse to members see same comment like this: "ı�ö�ç�ş�ğ�ü�Ü<Ö�Ç�Ş�Ğ�Ü�"
Is there anything i can do for fix? Hello, I would like to install a forum page on my site portableappsdb.esy.es but I have not found a page you explaining how to create a forum page .. What to do? here is dependency to have enabled plugin User from you too ? 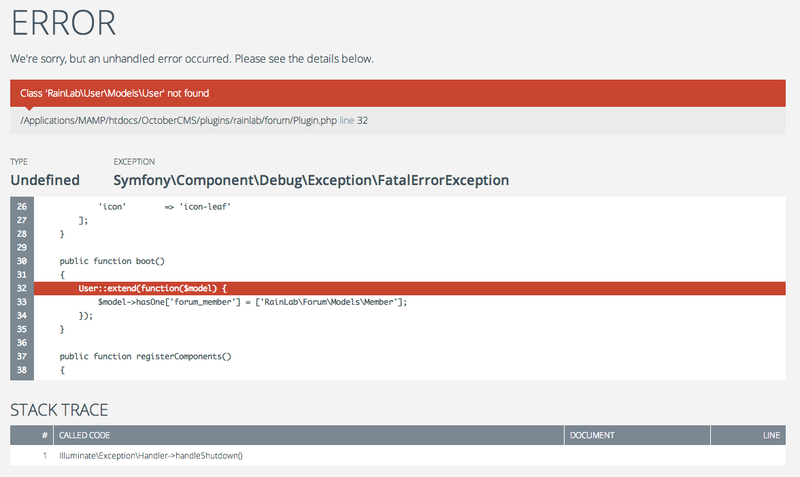 Without selecting user plugin I got an error, than some model user class was not found. Add button for administrators to purge all posts by a member. Fixes bug throwing error when a forum topic has no posts. Database maintenance. Updated all timestamp columns to be nullable. Minor fix to embed topic component. Update channel reorder page to new system reordering feature. Posting topics is now throttled allowing 3 new topics every 15 minutes. When a User is deleted, their Member profile and posts is also deleted. Improve the pagination code used in the component default markup. Fixes a bug where channels cannot be selected in the Embed component inspector. Improve support for CDN asset hosting. Users can now quote other posts.